A fun filled evening of entertainment for the whole family amongst the picturesque views of the Yarra Valley. Food, beverages and licensed bar available. 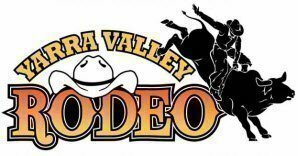 Carnival fun for the younger generation along with an action packed night of barrel racing, team roping, Bronc & bull riding. Funds raised from the rodeo will once again go to various charities, so pull on your boots for this exciting event. 1. * Plus booking fee. 2. General Admission ticket holders need to bring their own (camping) chairs. 3. Concession pricing applies to current Pensioner, Senior and Student card holders. Your concession card must be presented on arrival. 4. Children under the age of 16 MUST be accompanied by an adult at all times, as there are licensed premises at the venue. 6. Management reserves the right to refuse entry and to also remove any person behaving inappropriately. 7. All entry tickets are non-refundable but are transferable to other people. 8. Ticket holders of GRANDSTAND or RINGSIDE tickets are guaranteed a seat in their chosen Section. Seating is unreserved so we recommend you arrive early to ensure your party/group are able to sit together. Your purchase of a GRANDSTAND or RINGSIDE ticket will ensure enjoy a premium view of the event. 9. Smoking is only allowed in the designated Smoking Area provided. 10. No commercial photography, filming or recording is permitted without prior permission from the organisers. 11. All ticket holders understand they may be filmed or photographed while attending this event. 12. There will be PLENTY of food and beverages available around the grounds with a fully licensed bar. 14. No external food or drink is allowed into the venue due to health and safety regulations to which we must adhere. The only way to avoid issues is to stop people bringing food and drink items with them. Sealed unopened plastic water bottles are fine. ALL bags will be checked and items which are not permitted will be confiscated or you can certainly return them to your car if you wish. 15. Patrons will NOT be permitted to bring any glass items into the venue. 17. No camping on the grounds of the Healesville racecourse. 18. This is an outdoor event - we recommend you bring along a hat and sunscreen if needed.